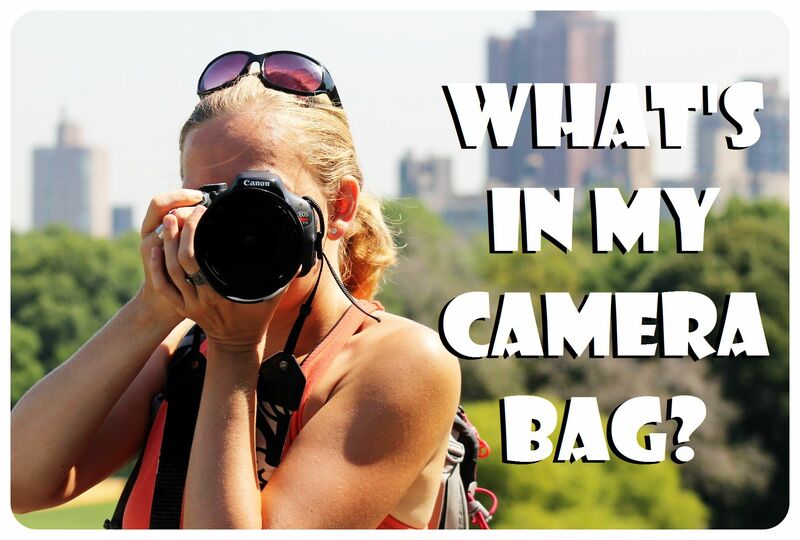 The past couple of summers I spent at least two months each year traveling around Europe – always on a budget. 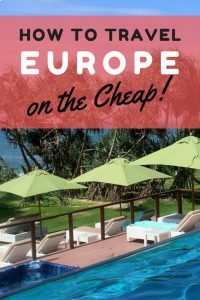 I now have budget travel in Europe down to a tee, and I wanted to share all of the cheap ways to travel around Europe with you. What’s the cheapest way to get around Europe? How do you find cheap places to stay in Europe? The cheapest option is of course Couchsurfing. But it can be difficult to find a couch or spare bedroom in Europe, especially during the summer months when hosts get swamped with hundreds of requests – especially in popular destinations such as Berlin, Prague, London and Paris. Make sure to send a personalized request instead of just copying and pasting a general request – as a couchsurfing host myself I can tell you that hosts despise those. When I request a couch, I always read through the host’s profile and find something to connect with them on which I then can refer to in my request. Renting an apartment is the best option if you’re looking for a little more privacy. Over the years, I’ve come to prefer apartments over hotels, and the main reason for that is that I really like having a kitchen while I travel. Having a kitchen means I can make me a cup of coffee or tea and the morning and prepare my own breakfast, I can prepare sandwiches for the day or a picnic lunch, and it saves me so much money to not have to eat out three times a day. If you don’t want to rent an entire apartment for yourself, you can also rent a room in somebody’s home – that way, you’ll help them cover their costs, but you still get to benefit from all the things that make couchsurfing so awesome: a local host who is happy to share his/her house with strangers, and they usually offer to take you out, or at least give you off-the-tourist-path recommendations for their favorite bars, restaurants and things to do. Whenever I rented a room on Airbnb, I was invited to join my hosts for dinner or a glass of wine or a game night. It made my experience so much more personal and memorable. When I travel alone, I don’t necessarily need an entire apartment to myself, but I do prefer having my own room instead of staying in a dorm. Private rooms on Airbnb are usually around the same price as a dorm bed. For a couple, most cities have super cheap studios and apartments (see picture above), so definitely check out Airbnb in addition to your favorite hotel & hostel search engine. By the way, if you don’t have an Airbnb account yet, you can sign up through my referral link and get up to $40 off of your first booking! If you don’t want dormitories in the search results, click the ‘Show Private Room Only‘ option (see screenshot below). Look for sales & special deals to get the best offers. 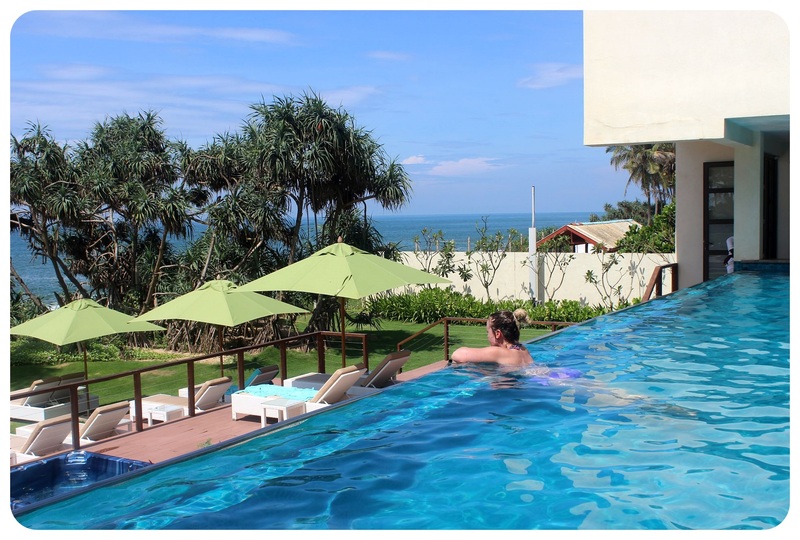 Check the customer rating – I personally never book anything that is rated lower than an 8. Omio is my first go-to website when I look to travel around Europe. What I like is that it shows me all the options I have to get from Place A to Place B: Plane, Bus, Train and (shared) car. And not only does it show me how much each of these options will cost me on the date of my choice, but also how long it will take me. That way I can still decide if I want to go for the $30 bus ticket over the convenience of a flight, or if it makes more sense to take a two hour flight over an eight hour bus ride. Omio has special rail rates as well – I often don’t find their rates on the official rail websites they take you to when you want to book a ticket, so make sure to go through Omio. Bus travel is hands-down the cheapest way to travel around Europe these days, and the number of bus companies that zigzag all over Europe seems to be growing steadily. It can be hard not to lose track of all the different bus providers and which ones cover which route, but that’s where Busradar comes in. 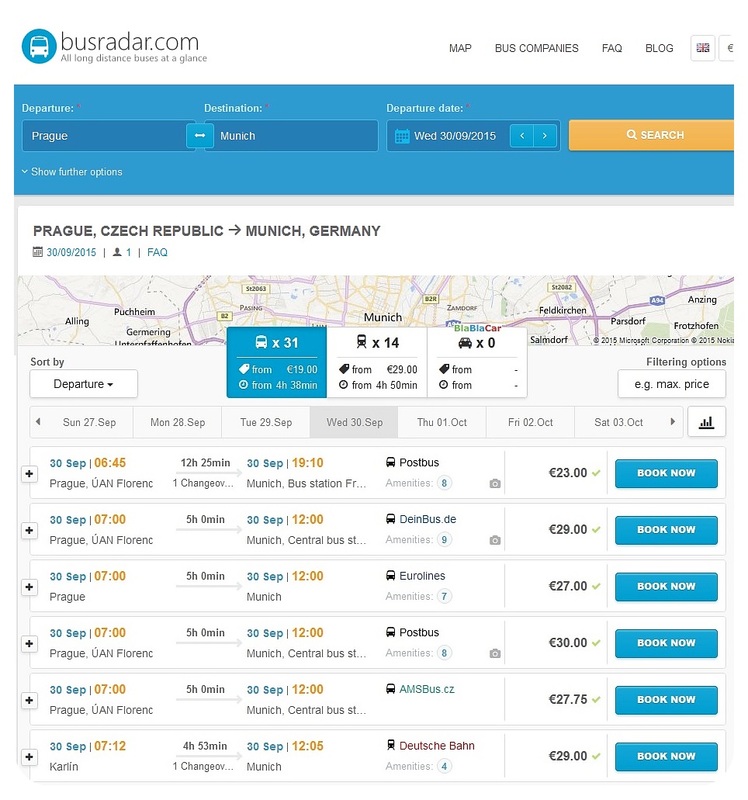 You simply type in your travel date and your departure and destination cities and Busradar will show you all the available bus companies that cover this route, and how much a ticket for each one is. Sometimes the difference between ticket prices is marginal, but sometimes companies have sales and comparing ticket prices can save you a considerable amount of money. Busradar also shows you which amenities each company offers, i.e. things like toilet on board, wi-fi, how many pieces of luggage are allowed and if there are power outlets. 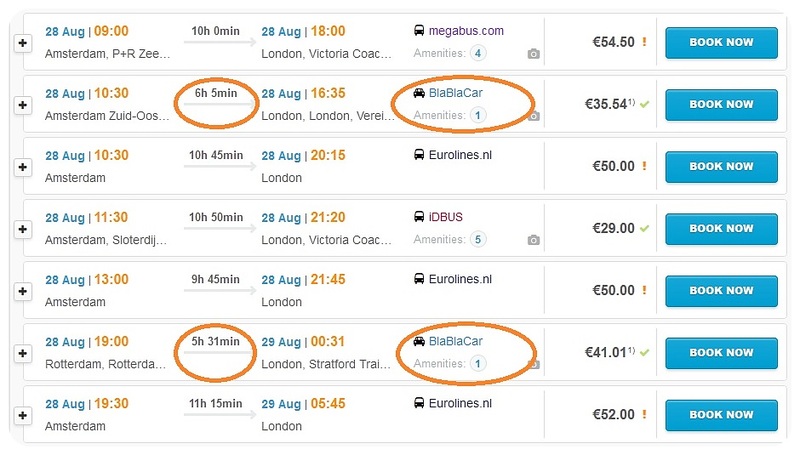 What I also like about Busradar is that they include car sharing (more on that in the next paragraph) in their searches, right in the listing with all the bus companies as you can see in the image below, pointing out how much faster car sharing is compared to bus travel. Tip: Busradar also has a free app for iOS and Android. 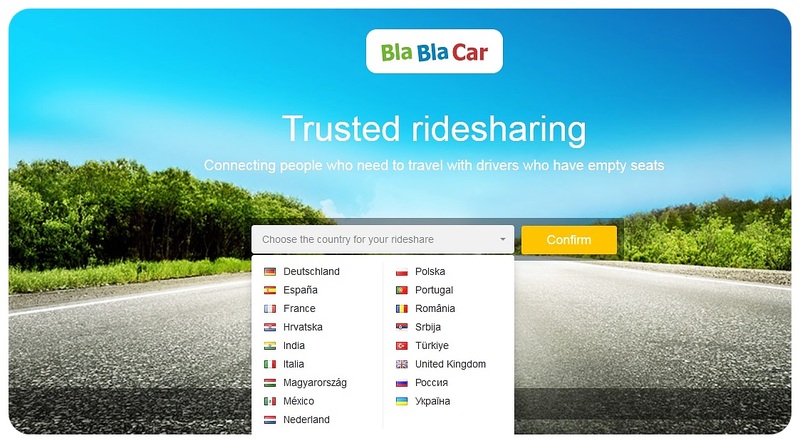 I’ve been using BlaBlaCar in Germany for years, and it has grown into the biggest car sharing platform in Europe. I have been using car sharing both ways – as a driver taking passengers with me, and as a passenger sharing a ride – dozens of times within Germany but also internationally from Milan to Munich via Austria, and I have always had great experiences. The great thing about car sharing is that you automatically meet like-minded people and can connect with other travelers easily. While car sharing is not necessarily cheaper than buses anymore (bus tickets are ridiculously cheap! ), it is certainly faster than taking a bus. Tip: If you are unsure about taking a ride with a stranger, read through the reviews that other passengers have left. BlaBlarCar also has a free app for both iOS and Android. I used an Interrail pass for the first time for part of my Euro trip in 2015, and taking advantage of Europe’s excellent train network was amazing! Interrail might be a little bit more expensive than buses, but it’s without a doubt the most comfortable way to travel around Europe. 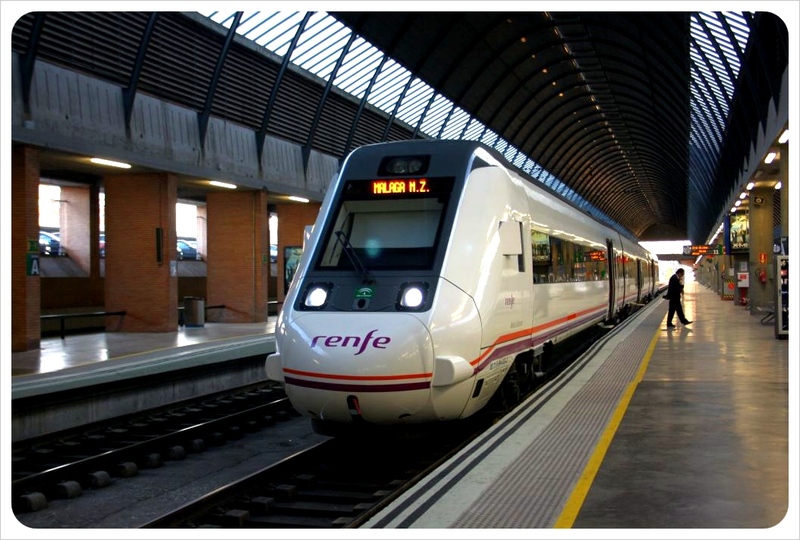 Trains in Europe are fast (many countries have high-speed trains), reliable and enjoyable. If you dislike bus travel, you should look into buying a Eurail pass, which starts at €46 for a 1-country pass and €192 for a Global Pass (valid in 30 countries!) – which is actually a steal. 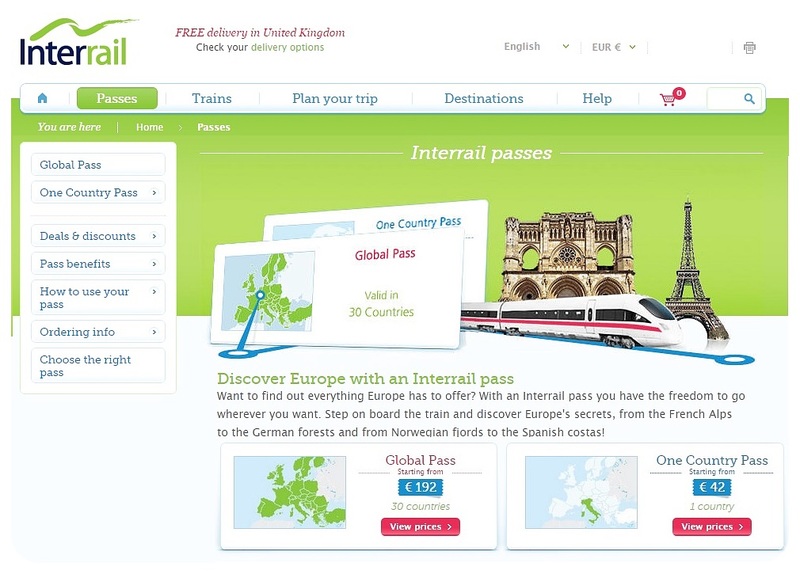 FYI: Interrail tickets are for people with a permanent residence INSIDE OF EUROPE. People with a permanent residence (for more than 6 months) OUTSIDE OF Europe, the United Kingdom, Turkey, the Russian Federation are eligible to purchase or use the Eurail Passes. Tip: If you’re planning a Euro rail trip I recommend downloading the excellent Eurail/Interrail app for iOS or Android which includes all train schedules and also shows you which ones require a reservation. Europe is blessed with several budget airlines – it is rare that I had to pay more than €50 to get anywhere within Europe, be it from London to Barcelona or Berlin to Istanbul. Flights can be ridiculously cheap (the best deal I’ve personally found was a flight from London to Cornwall for £1! ), and for some distances, say the UK to Italy or Portugal to Sweden, it simply makes sense to take a cheap flight instead of spending two days on trains or buses. 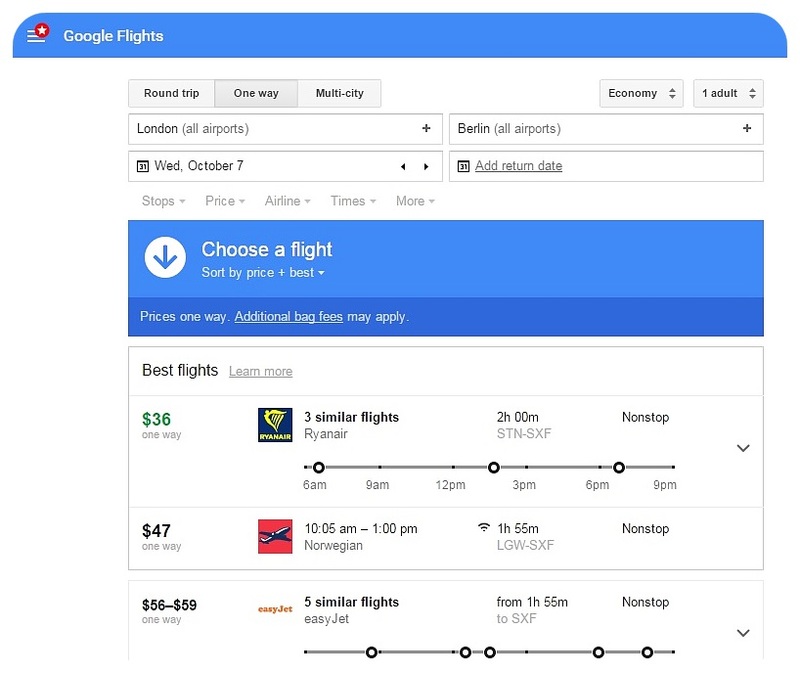 It can be a bit tricky to find out which airlines cover the destination you’re planning to visit, but Google Flights has become much better in including budget airlines recently – much better than Skyscanner even – and most other flight comparison websites don’t include budget airlines at all. 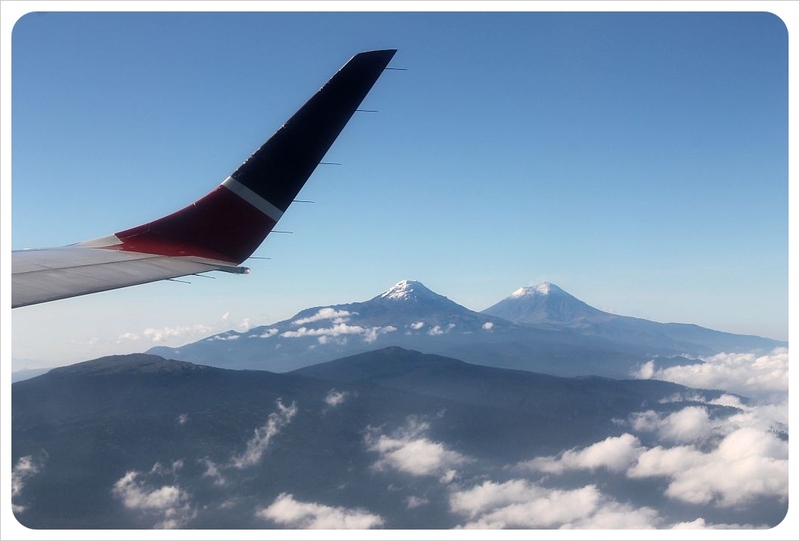 A quick Google search usually reveals which airlines go to the place you’re planning to visit, and this guide on budget flying within Europe by Rick Steves also has some great information, plus a list of all European low-cost carriers. As you know, I am usually an independent traveler, but sometimes even I can’t say no to a great travel bargain – and that’s how I found myself on Mallorca a few years ago: because I had stumbled upon a package deal that included flights and accommodation in a 4* hotel for a week for €200! And of course it’s up to you what you make of your vacation: I still ended up exploring the whole island with a rental car, but I didn’t mind coming home to a fancy hotel and knowing I didn’t have to deal with airport transfers. Package deals like this aren’t rare to find in Europe – right now you can find great last minute deals to places like Greece, Turkey and other Southern European destinations online – for example a week of self-catering in a beach resort in Greece including flights from the UK for £179! A week on the Turkish Riviera for £167 including return flights from the UK? Or a week in a vacation apartment in Cyprus for £232, also including flights? Yes, please! 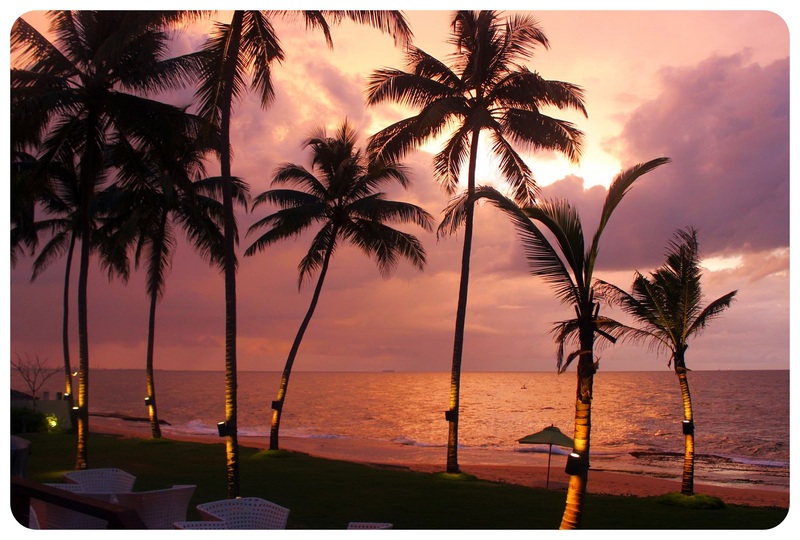 Looking for package vacation deals like this can enable you to include a week in a country that you might not be able to visit otherwise. These deals are particularly good in the shoulder season – and I don’t think that deals to Greece for example will ever be better than they are now. Check out websites like Lastminute.co.uk or Holidayhypermarket for package deals like those mentioned above. Do you have any tips on how to get around Europe on a budget? Feel free to share them in the comments below! Thank you so much for sharing these sites! We’re headed to Europe in a month, so these will definitely help me maximize our travel plans without blowing our budget. You’re welcome! 🙂 They’ve been lifesavers for me. Or at least huge money savers 😉 Enjoy your time in Europe! Absolutely love all of these sites! I’m still wanting to try out an interrail pass, however I seem to keep going on short breaks where it’s not worth it! Thanks for the travel tip discoveries. Always good to find new tools to put into the arsenal. Thanks for these tips! Just came back from a North American road trip and South America is next but all of these sites have been bookmarked for future reference! I’m beginning to become a huge fan of google flights, also. They key to cheap travel is to be flexible. Most people need a certain day/time for their needs. But if a person could care less when they go, and has time-freedom, they will find cheap flights, that’s for sure. Great tips Dani! I wish I had read this post sooner. 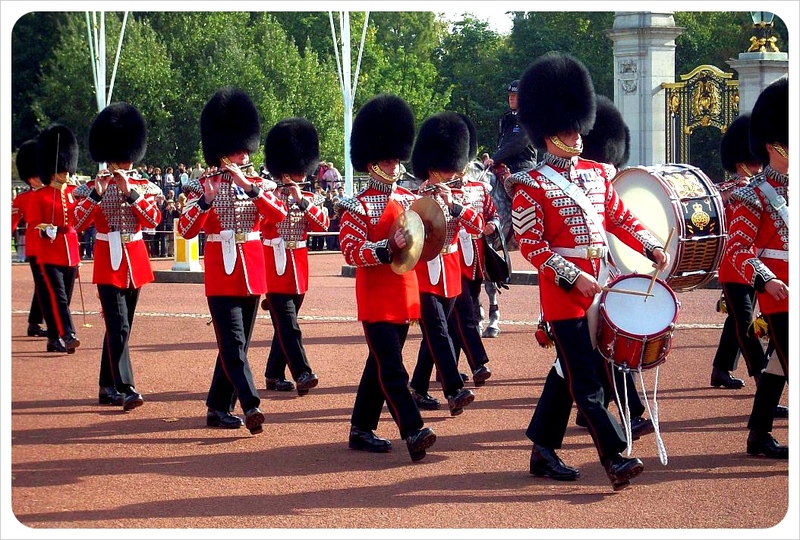 I have been in the UK for 6 weeks and will be headed home soon. I know I will make good use some of your suggestions when I return to Europe to explore some more next year. It will be cool to see how much time and money I’ll save using the tips. Doing Europe can be difficult, but it is possible! These are really useful! Who knew you could do car-sharing! Yes, and you meet really interesting people that way, Andrew 🙂 I do it all the time when I’m in Europe. Hey. Absolutely loved your tips.BTW How do you find these deals? I mean package holidays? Need help please planning Europe trip in April 18 days want to see 5 countries idk if it’s possible and I’ve researched so much I feel like I’m spinning. Idk to use the rail n all and don’t want to spend all my time on the road. Any help would be great we wanted to see 5 out of 6 of these with a 7 year old boy. Husband likes military stuff. So here it goes. Ireland, Scotland, London, France, Amsterdam, Austria, and Germany. I want to see best 5 with things we all like and if it’s possible to travel by train or car or bus idk thanks. 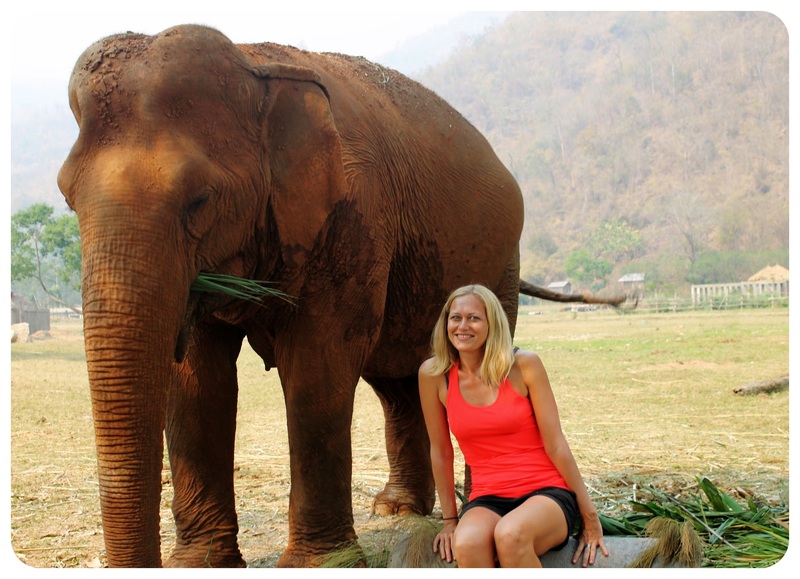 Hi Tabatha, it’s possible, but it’ll be a very rushed trip. I would probably leave out Ireland or Scotland. If you visit one city in each place, I’d recommend 3 days for each city. Everything else would be too rushed. So maybe leave Scotland out because you should really see the Highlands but that’s a 4-day trip in itself. So maybe leave that for another trip? When you say you rent a room or apartment. Do you do that in one spot and then travel around and go back? Or do you rent a room or apartment in different cities each time you travel? When I travel around, I usually stay in different cities. Europe is too big to choose one single base to explore from 🙂 I am using the Booking.com app as well as the Airbnb app to keep track of my bookings. Currently preparing for a trip through Germany, France and Spain – lots of different places to book! WOW, great information for new travelers. I was in Europe last year in April 16. I traveled from Germany to Belgium and Netherlands. I traveled through ICE and it was costly so I was not able to move around most of the time. I am going again to Europe in mid of September 17 and I am happy that I have lots of option through your website. Thanks a lot for great sharing. Yes, ICE is pricey when you don’t book in advance and get the ‘savings tickets’ 😉 I hope you’ll get to save some money on your next visit with my tips 🙂 Enjoy your trip, Sohail. Hey girls, I found the Stoke Travel Passport made travelling Europe really cheap for me. I’m notorious for not wanting to make plans, but I was still able to experience Oktoberfest, surfing in San Sebastian Spain, clubbing in Ibiza, and the San Vino wine fight booking all last minute. It’s a great deal and they look after everything, accomm, meals, even unlimited drinks haha. Good times.